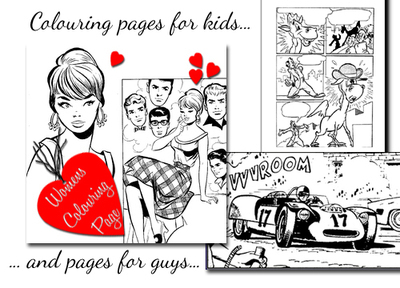 If you haven't tried it yet - have a go at using comicbook graphics for your paper and craft projects. It is a heap of fun! I've been having a good ol' time getting graphics ready for just this kind of thing! It started out because I wanted coloring pages I could relate to - grown up pages for nannas and aunties - I made some and then kind of couldn't stop. The images are retro - from the time when phones had to be dialed, letters were waited for, dating required a physical presence and people on the whole dressed with elegance. A nostalgic array of imagery probably suited to baby boomers. My main reason was to use the graphics in journaling - for art journals and diary type as well. Halloween Guys might like these. Cars Hot rods, racing cars. The most basic and inexpensive way to be creative if you're unsure of drawing is to cut and paste. All that is required is paper, scissors and glue. Add to that basic stationery - colouring pencils, paint and markers for writing and you're off! Look at the imagery - it might evoke memories from your own particular life experience. See how they relate to you, your parents or grandparents generations. Old photographs will give a clue of clothing worn, accessories used and hairstyles that were fashionable at the time.